Decided to join 21-Day Meditation Challenge but not sure how to go around it? Want to get more information on what to do every day when you start your meditation journey? Need tips on how to fit it into your busy schedule? 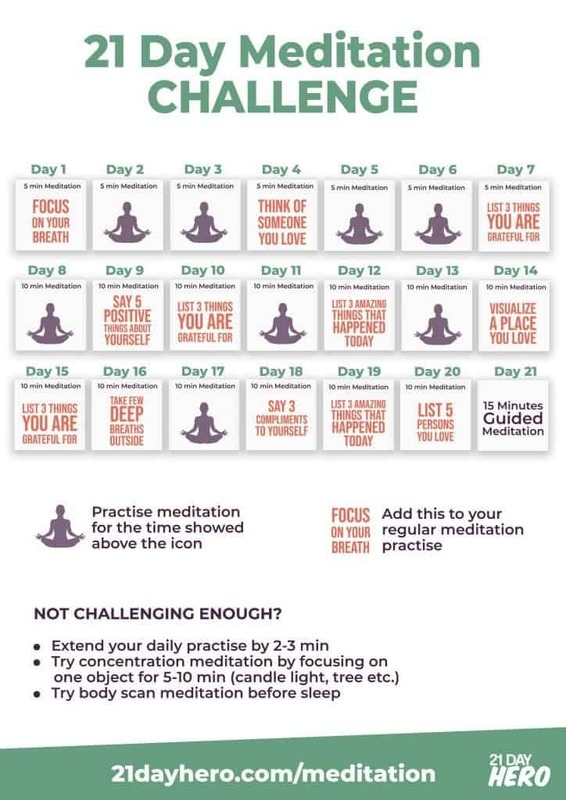 Scroll down to find our 21 Day Meditation Daily Plan with more precise instructions and practical advice for each day of the challenge. How to start meditating and actually make it stick? Everyone can start meditating – there are a number of guided meditation sessions available on Youtube or through different meditation apps. However, to see the real benefits of meditation, you have to do it on a regular (preferably daily) basis for a longer period of time. The key to changing your behavior is establishing new habits. Luckily, developing new habits CAN BE easy and simple. All you need is taking additional 5 to 10 minutes for yourself every day! I am sure you can find that much time in your busy schedule, am I right? All you need is a good plan and few guided meditation sessions to kick-off. By taking the 21 Day Daily Meditation Challenge you will kick-off your meditation practice and most importantly, start forming a long-lasting habit of meditation. *** If 5-10 minutes is too much, you can also make it 3 – 5 minutes. E.g., doing 3 min first week and increasing to 5 min from the second week. At this point, you are developing a habit of meditating hence consistency is more important than intensity. Meaning, it’s more important to meditate every day then the actual time of meditation. Check out this 2 min video with meditation teacher Leah Santa Cruz to learn more how long you should meditate if you are a beginner. If you have never meditated before, we suggest you download an app with some guided meditation sessions or find a Youtube channel offering meditation sessions. We advice using Insight Timer (thousands of free guided meditations), Omvana (over 75 free meditations) or Calm (ca 16 free meditations). WELCOME to you first day of meditation! It’s gonna be awesome! Feeling excited but at the same time overwhelmed with all the information around you? Watch this quick 2 min video with meditation teacher Leah Santa Cruz to learn how to meditate at home if you are a complete beginner. START with 5 min meditation session and when doing so, focus on your breath. Breath is the closest link we have with the present moment hence focusing on breathing will allow you to bring your mind and body together. Do 5 minutes of meditation of your choice on Day 2 and 3. Do your 5 minutes of meditation BUT… don’t stand up yet. Once you have finished your meditation, think of someone you love: your partner, family member, close friend or maybe even your pet. Imagine that person smiling and think how happy you are to have him/her in your life. I bet you will walk away from your meditation smiling. Keep this positive energy with you for the rest of your day! Whenever possible, try to stick to the same meditation time – be it morning, lunch break or evening. Having a set time will help you to establish your own meditation routine. Once you have done your 5 minutes of meditation, sit down for a bit longer, take a piece of paper and list 3 things you are grateful about. It could be as simple as being able to feel the ground underneath your feet, having a roof under your head and/or being able to see all the beautiful things around you! Keeping a regular gratitude journal has proven to improve self-esteem, reduce stress and make you happier. To start your second week of daily meditation, prolong your session to 10 minutes. If 10 minutes is too much for you, keep it to 5 minutes and increase the time once you feel ready for it. At this point, you are developing a habit of meditating hence consistency is more important than intensity. Meaning, it’s more important to meditate every day then the actual time of meditation. You are AWESOME (and you should know it!). At the end of today’s meditation, think of 5 positive things about yourself and say them out loud. Not only will this boost your confidence and self-love, but will also make you less stressed and healthier. Read more about the benefits of positive self-talk here. Just like on Day 7, list 3 things that make you happy and that you are grateful for. Say them out loud or write them down to strengthen the feelings. You have been meditating for a while now. Identify the time that has worked best so far for your meditation practice and stick to it as much you can to keep going forward. Now, think of a cue/action that triggers your meditation. This will be the action that will tell your brain “it’s time to meditate”. Maybe it’s stepping out of your bed in the morning? Or brushing your teeth? Or maybe it’s opening your door when you get home after work? E.g. if you meditate just after you brushed your teeth, then any time you brush your teeth think of it as a cue to sit down and practice meditation. Identifying a cue and routine connected to it will help you to develop a long-lasting habit of meditation. Read more about the science behind habit loop model here. Before you go to sleep, think of your day and list 3 positive things that have happened to you today. Had a productive day at work? A good meal? Or maybe made someone happy? Identifying positive things will help your mind shift away from negative thoughts and help you fall asleep with a smile on your face. Don’t give up just yet. Keep meditating! Stay where you are after today’s 10 minutes session, close your eyes and think of a place you love. A place where you feel safe and happy. Maybe it’s your childhood home, a spot you love to escape to or maybe even a restaurant/hotel you love to come back to with your loved ones. Visualize as if you were there right now and think of all the details: furniture, colors, sounds, texture (soft carpet or maybe even sand under your feet, in case of a beach). Feeling happier already? To start your 3rd week of meditation challenge, list 3 things you are grateful for. If you like, you can make gratitude journalling a regular thing after your meditation practice. Today make sure to go outside, stand still and take 3-5 deep long breaths: inhale deeply through your nostrils, hold your breath for few seconds and slowly exhale through your mouth. If possible, do it in the middle of the day, as a break from your work. Taking a few deep breaths will help you to connect with yourself and make you be aware of the current moment. Be here and now. Also, breathing exercise is a great way to calm your mind in stressful situations. Only a few days left on this challenge! Keep meditating and connecting with your inner self. Think of all the great things about you and say out loud 3 compliments to yourself. You can do it after your meditation practice, once you wake up or even in the middle of the day before an important meeting. Complimenting yourself will definitely boost your confidence. See this list of compliments you can tell yourself if you need inspiration. Just like on Day 12, list 3 great things that happened to you today before you fall asleep. Your life is filled with amazing people: your parents, your loved ones, your close friends, maybe even your colleagues! List 5 people you love and when doing so, think of each of the people for at least a few seconds. Remember them any time you feel down and be grateful for having them in your life! You can do this after your meditation practice or any other time of the day you get a chance. You have been meditating for 20 days already – CONGRATS on coming that far! Even if you missed a day here and there – you are still a hero! To celebrate your achievements, challenge yourself a bit more and prolong your meditation to 15 minutes today. WHAT's next? WHAT happens after 21 Days? It’s simple – if you like how meditation makes you feel, continue! In 21 days you will develop a small habit, which will help you to continue your journey much easier. What if you are not in love with meditation after 21 days? Don’t give up on it just yet – experiment with different types of meditation, change the time of the day when you meditate or try meditating in a group instead. Learn more about different 4 common types of meditation here. Learn more about group meditation, why it is so powerful and how you could start a practice with your friends from our chat with Benjamin Decker world’s leading meditation teacher. If you have any questions or suggestions for topics you would like to hear more of, drop us a comment below or reach out to us on social media.